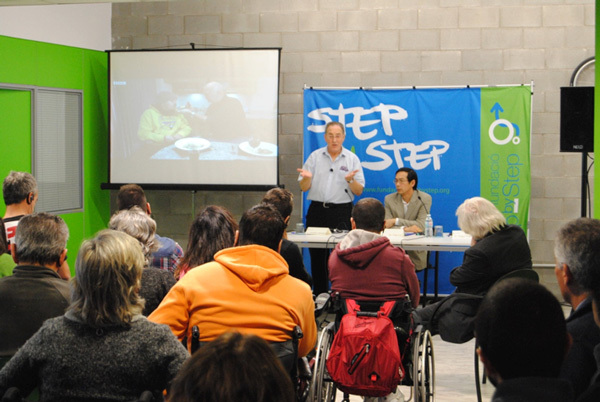 On December 16, we enjoyed at Step by Step Foundation an interesting conference by two researchers that presented us their recent achievements on experimentation in spinal cord injury: V. Reggie Edgerton Drs and G. Raisman. Dr V.R. Edgerton is a professor at the University of California at Los Angeles since 1968. His work focuses its efforts on solving the mystery of how neural networks after a spinal cord injury can return to reconnect and regain control of voluntary movement and how these mechanisms could be modulated by intervening on their activity. 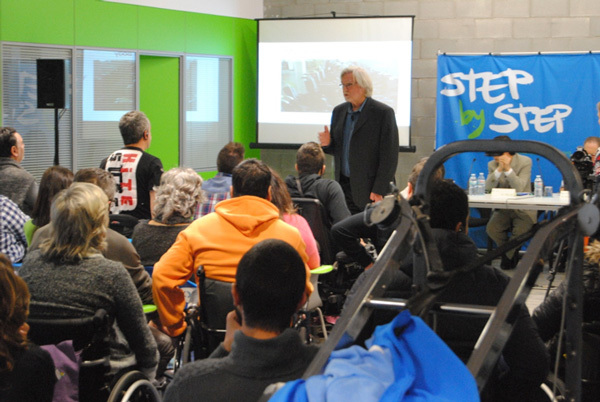 Dr. Edgerton showed results obtained in studies in rats demonstrating that after lower limbs paralysis induced by a spinal cord injury, rats recovered stepping movement without central control from the brain. Dr.Edgerton showed that in rats with complete spinal cord section, epidural electrical stimulation in combination with pharmaceutical compounds help the rats to support its weight and make stepping movements in different directions. Dr. Edgerton also showed that epidural electrical stimulation level has report success with recovery of voluntary movement in patients with chronic injuries. Professor Geoffrey Raisman, Chair of Neural Regeneration and Director of the Spinal Repair Unit at the University College of London, showed the latest results published in the scientific journal Cell Transplantation (Tabakow et al, 2014) where a Polish patient showed functional recovery of voluntary movement. The patient underwent a previous intervention of removal of the olfactory bulb for the production, isolation and amplification of their own olfactory glial cells. Dr Raisman graphically showed the potential of this cell type for its integration in the glial scar matrix and to create a better environment for axonal growth. Dr. Raisman said that after the good results obtained in this first case, his next step is to replicate the success with a new patient.